It is replaced by the Datalogic PowerScan PM8300. Multiple host interfaces in base station. A Tough Portable Tool for Your Toughest Jobs Freedom! 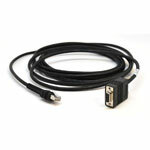 Are restrictive interface cables keeping you from doing business the way you want? Are you restricted to scanning only in the 25Â´/7.62m area around your host terminal? Well, not anymore! 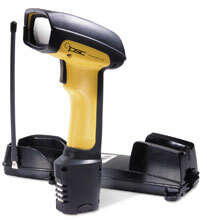 With the PowerScan RF wireless scanner, you now have the freedom to go where the work is, not the other way around. Now you only have to take the 12.7 oz/360 g PowerScan RF scanner to the 500 lb./227 kg pallet; not the pallet to the scanner. Utilizing the latest in Radio Frequency (RF) technology, the PowerScan RF has a range of up to 150Â´/46m. This allows you the freedom to scan pallets at the other end of the loading dock or boxes at the end of a warehouse aisle up to 150Â´/46 m from your host terminal. Its unique acknowledgment tone lets you know that your data transmission was successful. With multi-point capability the PowerScan RF allows you to assign multiple scanners to a single base station, thereby increasing throughput and reducing the cost of additional base stations and host terminals. The convenient base/docking station charges the battery every time the scanner inserted. The PowerScan RF can operate up to 8 hours or more on a single charge of the battery pack. Changing the battery is a quick 5 second job. An optional four-station battery charger lets you charge up to four battery packs at a time. The base station can be mounted on a counter, a wall or even a fork truck. The uniquely designed latch keeps the scanner in place even if your fork truck is going over floor grates or speed bumps. Built for Rugged Industrial Environments The PowerScan RF is based on the original PowerScan laser scanner, the first scanner designed from the ground up for rugged industrial use. The RF meets the same tough environmental standards such as an IP54 rating for dust and wind blown rain. And a drop specification of multiple 6.5Â´/2m drops to concrete! All models of PowerScan RF have the same rugged features that have made PowerScan scanners the choice for tough industrial applications. High impact enclosure with protective rubber cushioning. Flash memory for easy field upgrades. Four Different Models To Fit Your Needs If you need to read small, high density labels at 2"/5 cm or reflective labels at 36'/11 m up on the side of a warehouse storage rack, there is a model for you. The PowerScan RF models include High Density (HD), Standard Range (SR), Long Range (LR) and Extra Long Range (XLR). And every model is equipped with QuadraLogicâ„¢ II decoding software to read torn, disfigured and poorly printed labels.